Top Democrats call on the governor to step down or seek professional help, a day after he leaves an obscenity-laced voice mail for one legislator. LePage’s message to Rep. Drew Gattine. Warning: This audio contains obscenities. Gov. Paul LePage used the familiar metaphor of war Friday to describe Maine’s efforts to curb drug addiction, but he once again framed the battle in racial terms and effectively endorsed racial profiling of suspected drug dealers. Also Friday, leading state Democrats called on the governor to resign or seek professional help, a day after he left a profanity-laced message on the phone of a Westbrook legislator. In a State House press conference, the governor restated previous comments about the numbers of black and Hispanic drug dealers who are bringing heroin into Maine and likened them to the enemy in a war. Edited video below. Watch the full video. LePage returned to the theme of race Wednesday night at a town hall meeting in North Berwick, where he said that he has compiled a three-ring binder of photos of drug dealers arrested since January, and that more than 90 percent are black or Hispanic. The ACLU of Maine said this week that statistics show white people are more likely to sell drugs than black people. “According to the governor, Maine police are nine times more likely to arrest people of color for selling drugs than white people, even though we know white people are just as likely to commit drug offenses. This alarming disparity in arrests raises significant concerns that Maine law enforcement is participating in unconstitutional racial profiling,” said the ACLU’s Maine executive director, Alison Beyea, said in a prepared statement. According to the FBI’s Criminal Justice Information Service, 1,211 people in Maine were arrested on charges of drug sales or manufacturing in 2014. Of them, 170 – 14.1 percent – were black, and almost all the rest were white, the service said. On Thursday, a television reporter appeared to suggest to LePage during a brief interview that Rep. Drew Gattine, D-Westbrook, was among several people who had called him a racist. That prompted LePage to leave a profanity-laced and threatening voicemail on Gattine’s cellphone. Top Democrats called on the governor Friday to resign or seek professional help because of that message, and subsequent statements LePage made about Gattine in a meeting with reporters. Video: News conference with Reps. Gattine and Gideon. The city of Westbrook released an “open letter to the people of Maine” Friday that also condemned the governor’s conduct. “Once more Governor LePage has humiliated himself and the Office of Governor,” the letter says. The letter is signed by Mayor Colleen Hilton and two other city officials. But LePage, speaking to reporters Friday at the State House as the story was being picked up by national media outlets, did not apologize to Gattine directly and said he was only responding to Gattine calling him a racist. 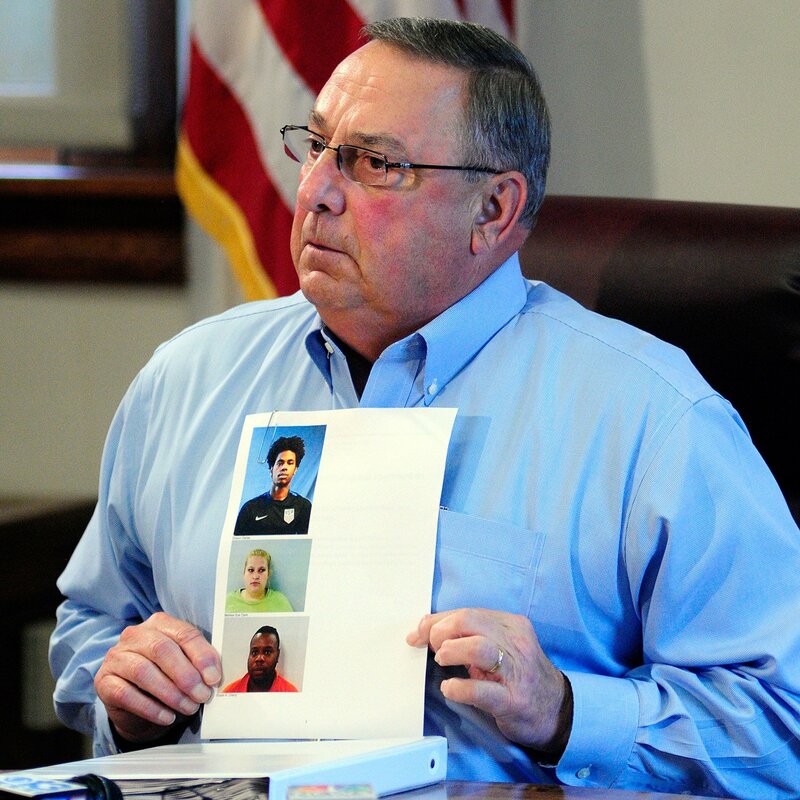 LePage on Friday also produced the three-ring binder he referred to during the North Berwick meeting, with press clippings and press releases along with photos from drug arrests in Maine. Displaying one page with a photo of a young white woman, he said, “A very lovely young Mainer, maybe 20 years old.” He then held up another page with a photo of a young black man on it and said, “And that’s the other culprit.” LePage noted that the binder had both white and black people in it, adding that most of the white people were from methamphetamine lab arrests, and most of the black people were from heroin arrests. When asked by a reporter why the race of the individuals matters, LePage said it doesn’t. Friday’s dueling press conferences – one by LePage, the other by Gideon and Gattine – came at a head-turning pace amid widespread condemnation of the governor’s actions this week. LePage has increasingly been focusing on the race of drug dealers as he has talked about the epidemic that has resulted in a record number of overdose deaths. Gattine was among many who criticized the governor for injecting race into the conversation, but the representative said he never called the governor a racist. The governor later told reporters about the message and said he hoped Gattine would release it to the public. He then made another threatening comment toward Gattine. Hear LePage’s comment about engaging in a duel. But on Friday, LePage said he intended the message for Gattine’s ears only, a reversal of what he said on the recording and what he told reporters a day earlier. LePage also said he isn’t going to resign and, when asked if he is emotionally stable enough to govern, if he has “a grip,” said he does. LePage later said he would resign if a whole list of lawmakers, both Democratic and Republican resigned and vowed never to run for public office again. But LePage did not say who is on his list. Gattine, the House chair of the Legislature’s Health and Human Services Committee, has frequently clashed with LePage on such issues as welfare, drug enforcement, problems at the Riverview Psychiatric Center and other reforms sought by the governor. Gattine said he has spoken with Westbrook police and state Attorney General Janet Mills about whether LePage’s threats were criminal. He said he’s concerned for his safety. “I’m going to be careful … but I’m not going to let the governor stop me from speaking out,” Gattine said. Gideon said she’s less concerned about the governor and more concerned about his words inciting others. “It’s not that we think that the governor is going to come out ready for a duel necessarily, but what his words bring other people to do,” she said. Democrats, and some Republicans, said the governor – who has a long history of making inflammatory comments – went too far. Sen. Roger Katz, a Republican from Augusta who frequently clashes with LePage, strongly condemned the governor in a Facebook post Friday. House Republican leader Fredette and Senate President Mike Thibodeau issued more measured calls for civility, with Thibodeau urging the governor to apologize for his statements. U.S. Sen Susan Collins issued a statement in response to a request for comment. 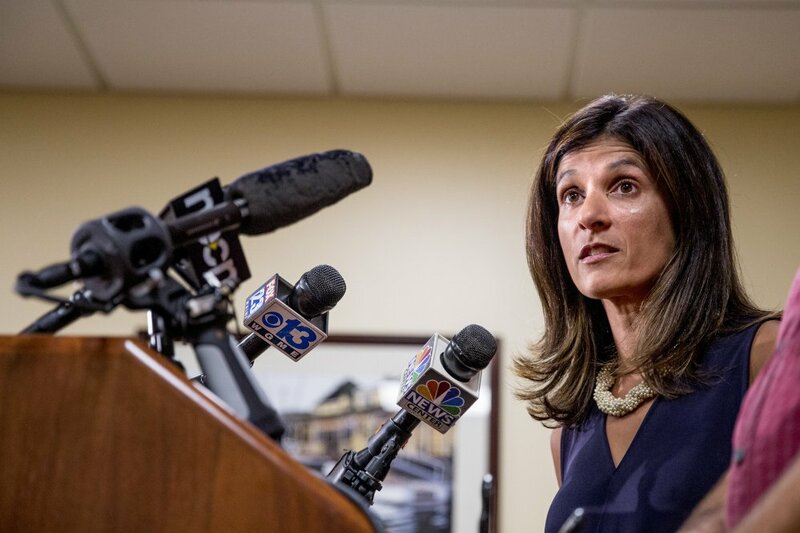 “The Governor’s language was inappropriate, and I’m glad he has apologized,” she said.